A snippet view from the window above my desk. After my hike up the Royal Mile, and more stairs than my legs are used to, I was greeted at the door by fellow Napier student, Jules. After waiting for the arrival of the second intern — another fellow alumnus from Glasgow University — we were introduced to Luath’s director, Gavin MacDougall. Gavin gave us a synopsis of Luath’s history and development, and an overview of the publishing process. We were then issued with a checklist for a number of tasks that could arise during our time with Luath. This checklist was the foundation of my placement, and allowed me to shape my own experience, and enhance my editorial portfolio. We were then allocated a desk and provided with a guide that was created by a previous intern, which proved incredibly useful for navigating the shared drive. I was then quickly given documents for proofreading and so, in keeping with Luath’s fast paced operations, my workload began almost immediately. Sandstone Press is based in the small town of Dingwall in the Scottish Highlands. Outside the office, which is shared with the Ross-Shire Journal, lies a field full of cows with hills and trees rising up behind. The loudest noise which penetrates is the cries of young seagulls fighting one another over food. 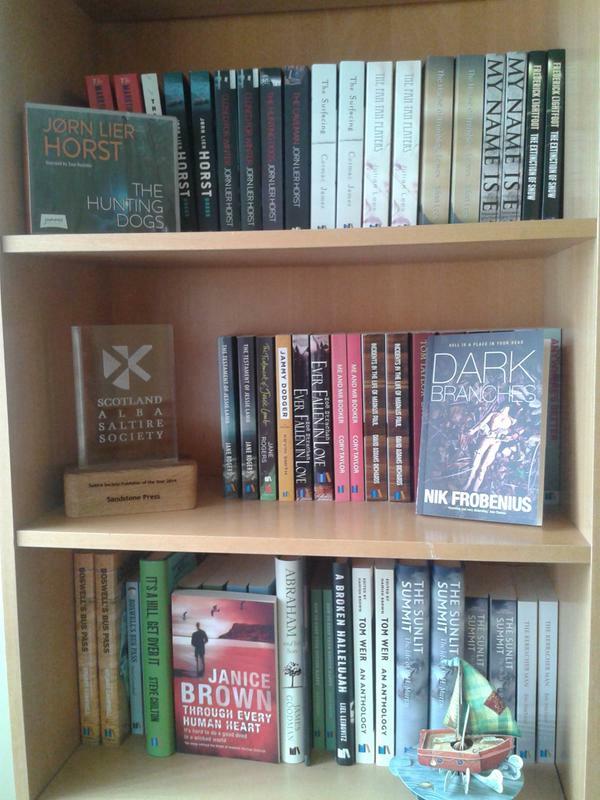 With so many companies based in Edinburgh and Glasgow, this is not perhaps where one would expect to find the Saltire Society’s Publisher of the Year but Sandstone Press like to do many things differently. In a number of ways, Sandstone behaves like a much larger publisher. With a list of only thirty books per year many companies would specialise but Sandstone choose instead to publish a wide range of books. Their list includes a balance of fiction and non-fiction and a Gaelic imprint, Lasag. There is no preference given to local writers as the company’s approach is international. Books recently released include newly translated Scandinavian Noir, a literary novel set in Africa and a non-fiction work focused on the Biblical figure of Abraham. This is not a company afraid to take risks. Because the company is small, with only three members of staff based on-site, I have been lucky enough to gain an insight into all aspects of their work. Moira Forsyth, the editorial director, takes the time to go over the editorial policy with me in depth before letting me loose on the submission pile and even a manuscript Sandstone is looking to publish sometime next year. Keara Donnachie, herself a recent graduate from MSc Publishing, is more than happy to have me watch how she handles the marketing and publicity for the upcoming releases and let me pitch in. Sue Foot, the company’s administrator, is extremely patient as she explains the intricacies of the finance and book prize submissions, both of which come under her purview. I’m especially lucky in that managing director Robert Davidson is only too happy to discuss the company’s strategy, illustrated with many stories from his years of experience. A number of the questions which arise are to do with the practicalities which as students we do not always appreciate. How do the books physically get to where they are going? When a company uses outside contractors, how clear is it whose responsibility which aspect of a job is? And when things go wrong, what is the best way to stay on good terms with other businesses while sorting out the problem? There is no question I can ask which goes unanswered, nothing I do not understand which is not explained. This is easily the best learning experience I could have asked for, with some of the most passionate people I have ever encountered. By the time I’ve asked my long list of questions, Robert has said, “You’ll be starting your own company next.” If I do, it will be in no small part due to my time with Sandstone Press. Located just a stone’s throw from Edinburgh Castle on the Royal Mile are the offices of Luath Press. 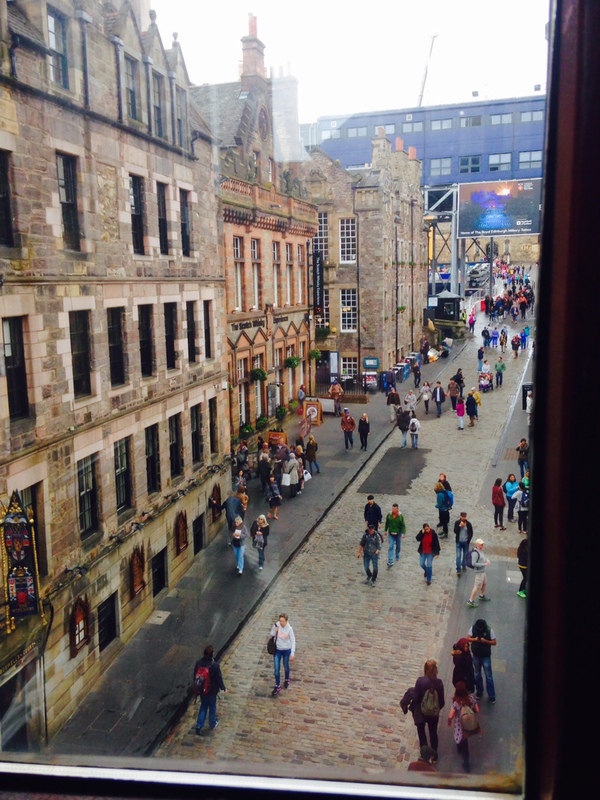 With views of the Royal Mile on one side, where you could watch tourists take selfies during your lunch break, and panoramic views of the city and the Forth of Firth on the other, you definitely feel as though you are working in the heart of Edinburgh. On my first day of my two week placement at Luath Press, the director Gavin MacDougall talked me through the history of the publishing company and the wide range of books on their lists, which range from poetry to fiction to history and more. I was introduced to the lovely team and then it was time to get to work. I was given the opportunity to work on a wide range of tasks, from marketing to editorial and everything in between. I wrote blurbs and created AIs, proofread texts, added event listings to the website. I also conducted research for potential new books. One of my favourite tasks was getting to look at some of the manuscripts that had been sent in. Luath Press accept manuscripts for consideration so I had the chance to read some interesting manuscripts for potential publication, from poetry to historical fiction. It was wonderful to get some experience in aspects of publishing I hadn’t worked in before. I feel like I learned a lot during my work placement and it was very beneficial to my career development. Thank you to all at Luath Press! When it came to choosing a company for my placement, I was really lucky to get a place with CMYK Design. CMYK Design is based in Edinburgh and covers all areas within publishing including producing magazines, newsletters, design, advertising sales and distribution. I knew that a placement with this company would be a great opportunity to take on new, unfamiliar roles and experience various aspects of a publishing house. Before starting the placement, my main objective was to get more experience in Editorial. CMYK produces a number of publications and I got the opportunity to work on their Scotland Outdoors magazine. I researched and wrote about upcoming outdoor events for the magazine’s website. (There are lots of outdoor events in Scotland!) I wrote about featured competitions, proofread a few spreads, contacted photographers for images to be used in the next issue of the magazine and contributed to their regular e-newsletter. I also got the opportunity to interview people, for articles on the website, including an Outdoor Camping feature and a feature celebrating the 20th anniversary of the National Cycle Network. I really enjoyed my placement at CMYK and found the whole experience very positive and informative to my future career. The team are extremely welcoming and there is always an opportunity to ask questions and learn more from the company. And, thankfully, there was never a shortage of tea and cakes!